ere at Arré, we pride ourselves in having a beautiful rainbow of a writing team. Punjab, Sindh, Gujarat, Maratha, we’ve got ’em all. Perhaps that’s why we’ve got such a diverse audience too. You’d expect our feedback to be equally colourful, and our treasured fans never disappoint. This week we realised “fan” might be too strong a word. 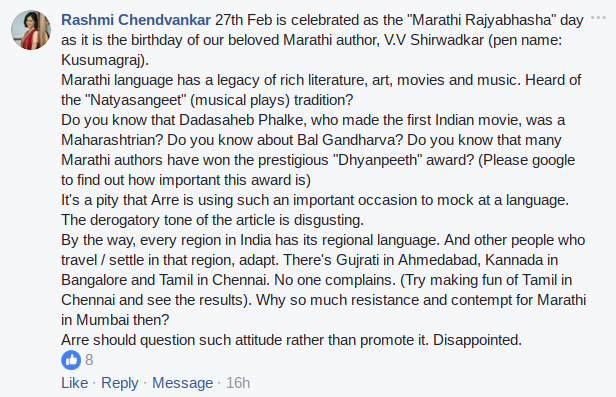 Esteemed commenter Rashmi Chendvankar took great offence to a piece by Jackie Thakkar, titled “Mi Marathi… Fakt When Convenient”. Jackie talks about how being half-Maharashtrian did nothing to help him appreciate the Marathi language, but did grant him the ability to jhol his way around Mumbai. Rashmi, took this to mean that Jackie hates the language, when in reality he just didn’t try hard enough. In the khara Marathi ma’am spirit, she treated us to an enlightening and pertinent history class. First of all, Rashmi, thank you. We had not heard of some of those things, indeed. Our author Jackie has downloaded Bal Gandharva’s entire discography on Saavn, and his mother has decided to quiz him about all previous “Jnanpith” award winners by the end of the week. He has also taken your disappointment with a stiff upper lip and decided it was time to question his attitude. We’re lucky to have people like Rashmi, who are always willing to help us grow as writers, and as people. A couple of weeks ago, another hapless writer took aim at his Jain brethren with a piece titled “Hey Gujjus, Who Made You the Food Police of India?” Within hours, he was informed how narrow-minded he actually had been on a very aggressive Twitter thread. He has now decided to become a vegan. Communal tensions can be stirred, but mutual indignation will always unite us. The same week, we saw the controversial “What’s Eating Bengali Bhodrolok? Their ‘Obhimaan’” article generate a surprisingly creative array of advice for the writer, helping her improve both her dating life and her grammar. Then there’s the infamous “‘Ughich Kashala?’ The Two Words that Kill all Maharashtrian Dreams”, for which our author was informed that he had an undesirable family background. Heavy stuff for a Friday afternoon. And so on and so forth with our thoughts on Punjabis, Odiyas, Bongs, Biharis, Tamilians, Rajasthanis (Marwaris and Rajputs), and folks from the Northeast. We’ve even written about Madhya Pradesh, which I’ll bet half of you can’t even place on the map. But we’ve learned a beautiful lesson from all the pot-stirring, muckraking, thinkpieces that we put out: Communal tensions can be stirred, but mutual indignation will always unite us. Rashmi, we don’t mean to single you out. You’ve just been doing what every Indian does when they feel like they aren’t being afforded the respect they deserve. It warms our cold, dead hearts to see that even in these troubled times, we can come together under the shared banner of disappointment. And if we can’t speak for our own, how will we speak for anyone else?